It has come to our attention that a number of other wood-burning furnace manufacturers have petitioned the EPA and congressional members for an additional 3 – 5 years before NSPS Phase 2 (2020) emission mandates are implemented and enforced. Let me make this real clear, we here at Lamppa Manufacturing strongly disagree with any extension for the upcoming 2020 mandates. No extension is at all needed and would only allow further polluting and poisoning of the environment by furnace manufacturers who, over the years, have neglected to clean up their smoke emitting furnaces. They’ve eschewed the environment for more profits. As long as they could get by with polluting the world they made little effort in improving their furnaces. There bottom line has always been much more important! Over 30 years ago the EPA started testing smaller stoves for emissions. It really was just a matter of time when the furnaces and Hydronic heaters would have to clean up their act too. In fact, I understand that the EPA randomly pulled some furnaces off the production lines at different manufacturers facilities and found them to be producing over 30 grams/hour of emissions, which re-enforced the EPA’s need and desire to set up regulations for emissions on them also. The need was there, and it was a prudent thing to do. Here at Lamppa Manufacturing in Tower, Minnesota, once smaller stoves were forced to be tested for emissions, we got busy to perfect our furnaces so they wouldn’t be polluters. We set aside time and money to improve our product. That way, once the EPA set up the regulations, we’d be ready to pass their tests. We strove for and achieved eliminating most smoke (99%+)from being emitted from the chimney. We realized through thousands of hours of testing and redesigns, that ‘No Smoke meant “NO Creosote”, as well as very little pollution. This was our goal. The furnace (Vapor-Fire 100) was tested by Intertek in 2016 and was found to be the cleanest burning and most efficient wood-burning furnace they ever tested. The emissions were 0.093 pounds particulate matter per million Btu’s of heat (only 0.72 grams/hour), Carbon Monoxide of only 49.33 grams /hour, and overall efficiency of 79%. The pounds pm/mBtu’s were ten times better than the current 2015 – 2020 standard and 40% lower than the 2020 and beyond standard. In 2009 I submitted both the Vapor-Fire 100 and the Vapor-Fire 200 to Intertek for the Energy Tax Credit test. With an overall efficiency of over 75% I was then able to give my customers the Federal tax credit of $1,500. While I was there I also had them both tested for emissions so I’d be ready for the upcoming (anticipated) regulations in 2015. This testing was very costly ($30,000 approximately) and time consuming. From what I understand no other manufacturers pursued the tax credit testing and/or some emission testing in advance. They probably thought I was crazy. How wrong they were. I was preparing for the future. In 2013 the EPA made it very clear that in 2015 Phase 1 would be in effect. But then they gave the manufacturers an extra 2 years so they had until May 15th of 2017 for Phase 1 (0.93 #pm/mBtu’s) and then in 2020 Phase 2 (0.15#pm/mBtu’s) would take effect for warm-air wood-burning furnaces. The pollution and poisoning of the air needed to stop. It posed a very real health hazard. 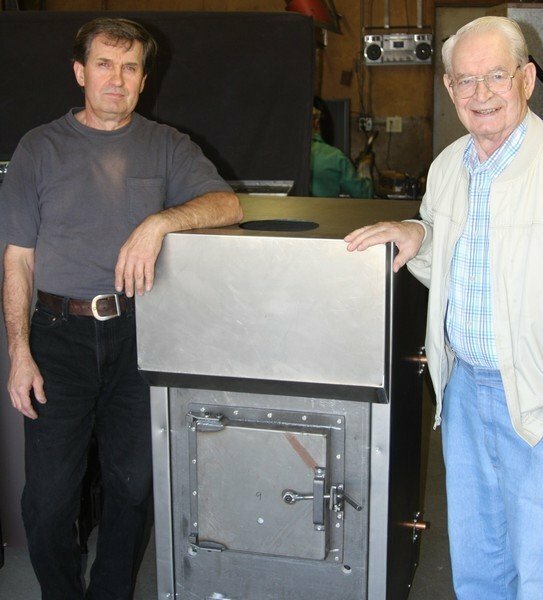 A good example of a manufacturer slowly considering the environment for more profits instead, with their furnace designs, would be the U.S. Stove Company. They recently testified before the Senate committee on Environment and Public Works – Subcommittee on Clean air and Nuclear Safety and the EPA for more time to get their furnaces into compliance for the 2020 mandates. They go on to say how an economic disaster will occur, as it trickles down, if they can’t meet the standards. They think that because they are the largest supplier of furnaces in the U.S. and have been in business for 148 years, that if they’re not around, then wood-burning furnaces will disappear. My question to the U.S. Stove Company is “what have you been doing to make your furnaces cleaner burning during all those 148 years, besides adding to your bottom lines? If you look closely at the comparative chart I attached – you’ll see their models emissions have an average #pm/mBtu’s of 0.452, their average grams/hour is 8.06 and their carbon monoxide grams /hour average is 477.45. These are totally unacceptable numbers for 2020 and beyond, and terrible for even the current standard. Our Vapor-Fire 100 average results are far superior when compared to all our competitors. The gasification that takes place promotes “smokeless combustion” which in turn is very environmentally friendly. This is the kind of furnace that should be embraced wholeheartedly by the EPA. If it has taken over 100 years for the U.S. Stove Company, and 30 years or more for the other manufacturers to get to where they are today, I don’t think any additional years (perhaps 3 – 5) will make any difference at all. In all these cases it may take complete redesigns, re-UL approvals, re-EPA testing and an altogether different mindset on how to burn wood cleaner (correctly). This just won’t happen in 3 – 5 years. All this will do is allow these manufacturers additional time to pollute and poison the environment, add to their bottom lines and get more people mad at wood-burners. Also, a huge problem and potential disaster can occur when a furnace has to be re-designed in a hurry just to pass a test without real-world usage for a number of years (field testing). These new furnaces won’t have a proven track record for reliability and safety. Does it actually work well beyond the lab tests and will the furnace stand up to everyday usage during the heating season, year after year? I heard of one manufacturer who had to buy back thousands of furnaces because they started to crack, evidently not a long enough track record in the field. Ouch! A financial and safety nightmare! Our Vapor-Fire 100 and Vapor-Fire 200 were designed to burn clean over 30 years ago. They weren’t just designed to pass a test. We have a great track record. They actually enhance the environment along with making wood-burning safer and much easier. If the EPA were to extend the 2020 mandate it would be detrimental to our current expansion plans and destroy millions of dollars in potential sales. It would be terribly unfair to Lamppa Manufacturing, who has invested hundreds of thousands of dollars and 30 years or more of work to meet and beat the Phase 2 mandates. Please leave them exactly where they are. It’s not our fault other manufacturers were slow to re-engineer and reinvest.